It is essential we continue working towards breaking down the stigma around suicide, reducing isolation and supporting children and young people following a suicide death. 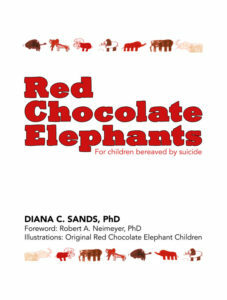 ‘Red Chocolate Elephants’ is an activity book and DVD resource for children bereaved by suicide. 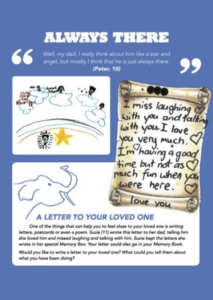 In a world where children are often forgotten mourners, this unique combination of text, pictures, and voices – all in the words of bereaved children themselves – will be a treasured safe haven for young people to hear their fears, questions, and difficulties put into words by other children just like them. On the accompanying DVD, these same youngsters speak their words aloud as we see their drawings of their experience. The book and DVD are an excellent resource for parent and child to use together in trying to face the suicide of a loved one. This is also a valuable resource for those supporting children in schools and others therapeutic settings. Children and suicide is an area that no-one seems to want to deal with, so when a parent or relative of a child is faced with the loss of a family friend or loved one to suicide, it is essential they are able to access coping tools and support. 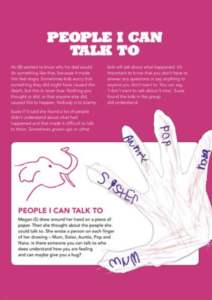 It is crucial that a child’s carer or parent finds out about information and strategies that can help talk about the death and work out ways to cope. You can purchase or donate a copy of the book and DVD for a school, a family, community group and assist those bereaved by suicide. Please visit our shop if you would like to purchase a copy or click on donate to assist in the Red Chocolate Elephants project.